Asian central banks are yet to follow the Fed’s rate hiking cycles even though many Asian policy rates are at historically low levels. But this could start to change. In the Fed rate hiking cycle of 1994-1995, five of the eight Asian central banks, excluding Japan, followed suit. The second cycle in 1999-2000 saw three of these banks hiking rates. By the end of 2004-2006, the third hiking cycle, which lasted 25 months, all eight central banks had hiked. It could continue as global market competition, automation and so-called ‘Amazonification’ intensify, in line with Asia’s rising technology penetration rates. This has been a clear pattern in Asia, and it gives its central banks more leeway to have monetary policies that are independent from the Fed. Rather than hiking interest rates, Asia has heavily deployed these tools to contain credit and property market booms. Amid a slow Fed hiking cycle, this could sustain the global hunt for yield and strong capital inflows to Asia, keeping liquidity flush. Asia is the most exposed region to a China setback, North Korea or US protectionism. Asia’s central banks may want to take out insurance by keeping rates low. The large build-up of private domestic debt in Asia may have lowered central banks’ willingness to hike over fears of triggering a wave of credit defaults. Asia’s historically low bond yields suggest that these factors are largely priced in. However, with stronger and more synchronized global growth, some of these factors could start to fade, such as low inflation as well as the ECB and BOJ in QE mode. The recent rise in oil prices could spread to other commodity prices and lift headline Consumer Price Index inflation which, with mostly adaptive inflation expectations in Asia, could over time cause core inflation to creep. 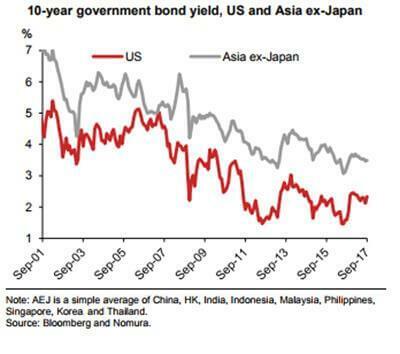 If this occurs, and if Asia’s central banks remain on hold, perhaps due to tail risks and debt overhang, bond markets may start perceiving them as falling behind the curve. Read the full report here for the updated forecasts for each country.